What are Google’s Responsive Search Ads? Google recently released a new type of search ads; the responsive search ad (RSA). With this powerful new type of Ad, it will become easier than ever to get relevant ads in front of your customers. By offering more characters and actively combining your headlines and descriptions, responsive search ads allow you to create one ad that shows more relevant messages to your customers. Google does this by testing different combinations of headlines and descriptions you provide, to find top performing combinations for different search queries. Similar to a regular text ad, you provide multiple headlines and descriptions to promote your company. However, with responsive search ads, you only have to create one ad with multiple headlines and description options. You can provide up to fifteen headlines and four description lines and Google will do the rest for you. This gives Google over 40,000 possible combinations to test! How do RSAs Benefit Me? Using responsive search ads has many benefits for your business. It saves time since you only have to create one ad with multiple options. You should aim to get at least 10 different headlines and 3 descriptions, to take full advantage of RSAs. Responsive search ads also give you more flexibility with your ads. RSAs adapt to different device widths, allowing you to show up to three headlines and two descriptions fields of 90 characters. This gives you more room to share your message with potential customers. Responsive search ads will always show at least two headlines and a description, even on smaller screens like mobile or busy search engine results pages (SERPs) so you know your ad is still being seen. With responsive search ads, you don’t have to give up control over your ad content. You still provide all the headline and description content. You can even restrict a position to show specific headlines or descriptions exclusively with pinning (which we will talk about in more detail later). RSAs are predicted to give ad groups a click uplift of 5 to 15% by increasing your opportunity to compete in more bid auctions. With more clicks coming in and more free time you will be able to focus on other areas of your business, letting the Google find the best combinations for your ads. How Does Pinning Work? Should I Pin Certain Headlines? The pinning feature of responsive search ads allows you to keep control of your ads. You will want to use this feature if there are certain headlines or descriptions that must show every time the ad shows. There are multiple ways to use pinning to give you control of your ads. You can pin one field to one position, allowing that field to always show in that position. This means that no other field will be able to show in this pinned position. You can also pin multiple fields to the same position. For example, you could pin multiple headlines to the same position, which would guarantee that at least one of them will appear in every ad, in the position they are pinned. This helps you make sure that you know exactly what options could display in a certain position. You can also choose to pin all positions. For example, pin three headlines into 3 different positions. Although this gives you full control over what headlines show and where they show, it means you will have few ad combination possibilities, which means you might not reach as many potential customers. What are some Best Practices for Responsive Search Ads? When creating your new responsive search ads, it is important to keep a few things in mind. First, you should try and provide at least 5 distinct headlines. You don’t want headlines that are repetitive or contain similar phrases, as these won’t give you many options for combinations of headlines and descriptions. 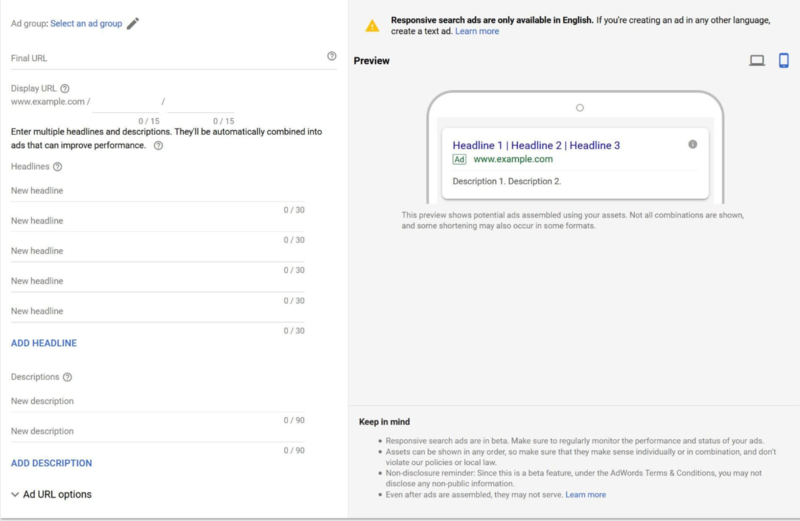 Google actually won’t show your RSAs if your headlines or descriptions are too similar. You want to spotlight different features, benefits, offers, and calls to action. After you have written the distinct headlines and descriptions, you may want to pin certain headlines or descriptions; ones that you want to always show with your ad. For example, if you always want one of the headlines to be your website, you should pin that headline. To guarantee that this headline will show, you need to pin it to headline position 1 or 2, as these are guaranteed to always show. If you want to pin a description you need to pin it in position 1 to guarantee that it will show. The key is to pin sparingly. If you pin too many positions, Google won’t be able to test nearly as many combinations. Pinning one headline reduces the amount of testing Google can perform on Responsive Search Ads by over 75%! Pinning 2 headlines reduce the opportunities down by 99.5%! When picking an ad group to test your responsive search ad, you should pick one of your non-brand, high impression ad groups. A high impression ad group is one with greater than 50 impressions per day. These groups will yield the best performance for your RSAs. You should also make sure to apply only one responsive search ad per ad group. 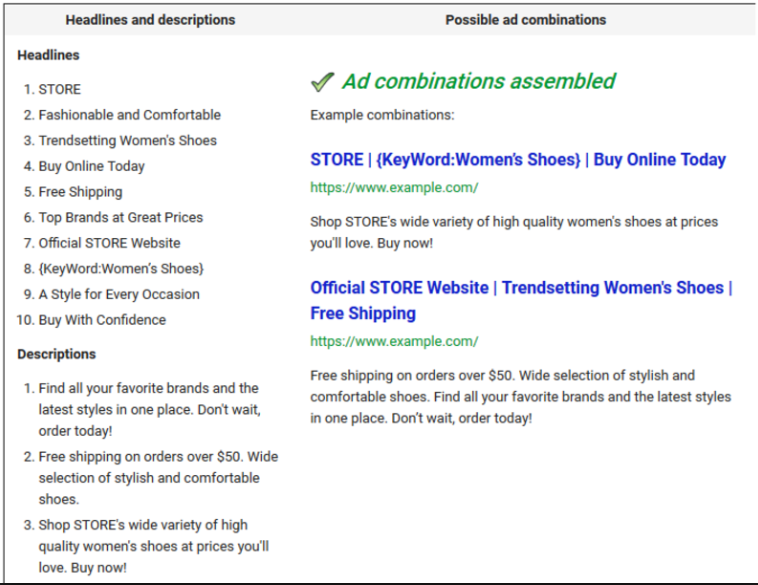 You only need one responsive search ad with multiple headlines and description options for Google to start testing combinations. Make sure that the ad groups you choose to implement RSAs also have at least one extended text ad (ETA) in the ad group as well as this will help you as you test out your new RSAs and make sure your ads surface as often as possible. Responsive search ads can help you make your search ads even more relevant to customers. By following these tips you will be able to take advantage of RSAs and see your ad groups benefit. With the help of a digital marketing agency, you can really see the full benefit of responsive search ads. InSegment is a Premier Google Partner. Visit our website to learn more about our paid search management services.